The Long Island Commission For Aquifer Protection (LICAP) recently held open public hearings and an NSWCA delegation was present totestified. The purpose of the hearing was to collect public input on protecting Long Island’s sole source aquifer and the LICAP’s draft State of the Aquifer report. The NSWCA delegation was led by Karl M. Schweitzer (Commissioner Hicksville Water District), Thomas P. Hand, (Water Commissioner of the Massapequa Water District), and Vincent Abbatiello, Water Commissioner of the Westbury Water and Fire District. 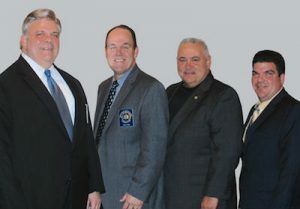 L to R: Raymond J. Averna; Thomas P. Hand; Karl Schweitzer; Vincent Abbatiello. Commissioner Abbatiello further observed that the delegation also made additional recommendations for combatting nitrates, saltwater intrusion, and conducting a professional review of regulations to keep road salt out of shallow wells.